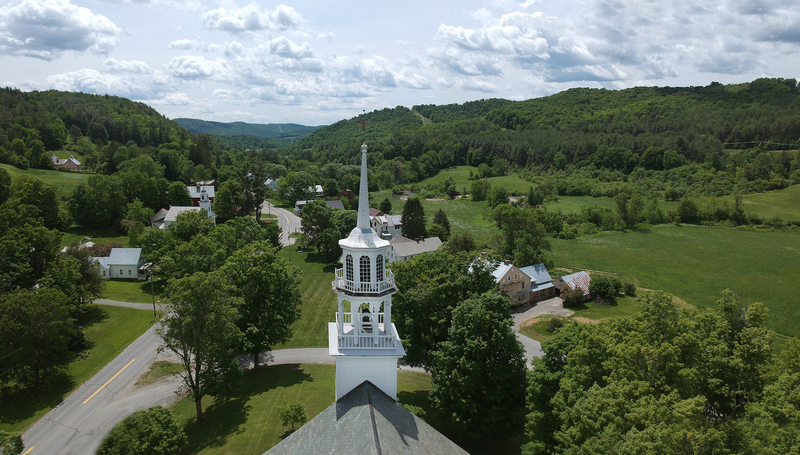 On June 26, 2018 , the National Trust for Historic Preservation placed the central Vermont towns of Royalton, Sharon, Strafford, and Tunbridge on its annual watchlist of endangered places. The decision came on the heels of a Utah-based developer’s ongoing proposal to construct NewVistas, a planned community he envisions will attract tens of thousands of new residents to the four-town region of Vermont. So far, the developer has acquired over 1,500 acres in the area. The Vermont Natural Resources Council and the Preservation Trust of Vermont, along with a wide range of other local and state partners, continue working together to lead advocacy to stop the planned development, under expectation that the development would irreversibly disrupt the character of this rural Vermont area, historic and otherwise. “The decision to place Royalton, Sharon, Strafford, and Tunbridge on a national watchlist of endangered places eliminates any doubt that the NewVistas development proposal poses a significant threat, not only to these four small rural communities, but also to the surrounding region,” said Brian Shupe, Executive Director of the Vermont Natural Resources Council (VNRC). We are elated to announce David Hall’s decision to abandon his NewVistas development in Vermont. This is an opportunity for us to get creative in a way that engages community members in thinking about the future of this region. We look forward to working with new partners in developing innovative strategies which reflect community values and are in-line with current town plans. We are very fortunate to have diverse partners and a strong local team to help brainstorm the best way of reintegrating the 1500 acres back into our communities. Our hope is that David Hall sees the greater good in this process, thereby enabling us to plan for a brighter future for this land. Over the last two years the four towns have developed closer ties by working together through the threat of NewVistas, and it will be important for us to continue this regional relationship. Royalton, Sharon, Strafford and Tunbridge share common roots in their working landscapes as well as similar economic issues. We have a great opportunity in front of us and we need to make the most of it together. We are incredibly hopeful for the future and we look forward to remaining a resource and advocate for this region. We are excited about the chance to begin focusing our energy on our real work, bringing vibrancy and opportunity to our communities.